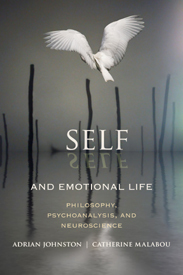 In Self and Emotional Life, Adrian Johnston and Catherine Malabou diagnose an incapacity for Continental thinkers to embrace an “authentically materialist theory of subjectivity” (ix) such as it is emerging in the neurosciences. Their project offers a multifaceted dialogue between philosophy and the neurosciences to bridge this gap, and they organize this dialogue in the shape of a co-authored book comprises of two separate section written by each author, who then subsequently echoes each other’s writings, Johnston addressing some of Malabou’s critiques in the introduction to the book, and Malabou responding in the concluding part. Drawing from neurological studies of brain damage, Malabou articulates the figure of a “dis-affected subject” as foundational to the theory of subjectivity. This figure emerges in being “deprived of the ability to be affected so as to experience emotions and feelings” (xvii). Johnston’s analysis draws from the possibility for “unconscious affects” (xvii) within the corpus of psychoanalysis as a way to bridge a dialogue with the neurosciences. Malabou wonders whether the neurosciences succeed in articulating a conception of affects that deconstruct subjectivity (3). She considers attempts in philosophy, psychoanalysis and neurobiology to destabilize the foundational status given to autoaffection in the explication of the modern subject. Each discipline investigates the origins of affect, which she defines as a modification resulting from an encounter (5). She explains that an affect encompasses “every kind of modification produced by the feeling of a difference” (5). As the model that has dominated philosophical inquiries of subjectivity, “autoaffection” relays the process through which a subject becomes aware of itself first as an other for itself. Autoaffection constitutes the primary affect whereby all other affects emerge (6). Here we have an affected subject, meaning that a capacity for affect constitutes the precondition for subjectivity. Yet Malabou wonders whether there can be an affect without autoaffection, without a subject? For Malabou, the work of Antonio Damasio on brain damage explores precisely such possibility and articulates a model whereby within autoaffection is inscribed a potential for detachment from one’s own affects that is activated when the brain is impaired (7). She maintains that the disappearance of emotional processes that accompany certain forms of brain damage constitutes a modification. This modification renders the subject dis-affected and generates a new subjectivity. This new theory undermines the philosophical model of autoaffection by showing how the subject is, at its core, not an “affected subject” but encrypted in a potential for disaffection to be a nonsubject (8). Malabou’s concept of dis-affected subject challenges philosophical models of autoaffection in which the affect of wonder is constitutive of subjectivity. Wonder is an ambivalent affect given that one wonders what it is that the “wondering” subject is struck by: is it the surprising object or the subject’s a self-surprising ability? (9-10). Wonder itself however cannot be deconstructed given that the work of deconstruction requires wonder (11). To counteract this paradox, Malabou argues that one must allow for the possibility to sever wonder entirely, a task that eludes philosophical accounts. The neurosciences, however, reveal that after brain damage a conscious subject may remain intact while the affected subject itself is destroyed. In such cases, while the capacity to wonder is forever lost, there is nevertheless an affect that generates a new subjectivity. This new model from the neurosciences suggests that autoaffection originates in the brain as a nonconscious structure (26). Brain events are intimately linked to our identity (28), yet not as sufficient conditions to secure an identity (29). Located in the body, a conception of the brain must encompass attention to both its “natural and social environments” (30); the brain is a fragile open structure, a “sensuous and affected organ” (30). Here emotions function as the homeostatic regulators of brain processes. Hence, Malabou illustrates that wonder can be located “at the interface between the nonconscious homeostatic attachment of the self to itself and the conscious autobiographical experience” (33). In this model, wonder is no longer an aptitude of the affected self in isolation. More importantly, the ability to generate an account of the self is restricted solely to cases when the “neural self” has been lost, such as when brain damage occurs (34). Without this event it is impossible to dissociate or to locate the “self,” given that the processes through which the “self” is made and remade happen in an ongoing interaction between the different strata of unconscious and conscious states. When subjectivity works there can be no witness to these processes: they are not located in one particular zone but are complexly entangled and arise in circuits (33). This account of the subject is paradigmatically materialist for Malabou because it reveals that the subject is “fundamentally, immediately and biologically” a stranger to itself, a process encrypted within the structure of the brain itself and not simply of consciousness (34). Brain damage therefore has psychic effects in this new materialist theory of subjectivity whereby the subject is biologically absent to itself (58). In the second portion of the book, Adrian Johnston draws a distinction between theoretical philosophical descriptions, from which Malabou conducts her analysis, and pragmatical philosophical prescriptions. Johnston explains that the affect of wonder corresponds to the primal focus of theoretical philosophy, whereas the affect of guilt constitutes the “catalyst for the deliberations, decisions, and deeds of concern to philosophy’s prescriptions” (77). Johnston asks whether it is possible to feel guilt without being (fully) conscious of such a feeling (79). Using the feeling of guilt as a gateway to articulate the existence of the affective unconscious, Johnston illustrates how psychoanalysis contains the seed of a conception where an affect—guilt—can be (mis)felt. This reading creates a space for dialogue with the neurosciences for Johnston (90). His reading of Freud reveals that the affect of guilt is situated within a “topographical variety of anxiety” (100) from which Freud distinguishes a “misfelt affect of guilt” from “unconscious affects” (108). Johnston is particularly interested in the feeling of guilt that is not felt as guilt, both misfelt and misinterpreted as anxiety (110). Then considering Lacan’s corpus, Johnston explains that, for Lacan, anxiety as an affect is produced as an effect of the signifier. This reading leads Johnston to wonder whether “certain affects [can] ‘represent’ different affects” —i.e. can a feeling of anxiety stand in for a feeling of guilt not felt as guilt (135)? He reminds readers that Lacan posits anxiety as the only affect. In fact, while affects remain enigmatic for Lacan (they are senti-ment, concealing something else about themselves, both felt and lying (146)), the affect of anxiety however paradoxically cannot deceive, and it emerges as a disturbance. While adamantly rejecting the notion of “unconscious affects,” Lacan’s conception of anxiety opens up the possibility, for Johnston, of a subject who can be stranger to itself “at the level of feeling” (149). Bridging his finding through the neurosciences, Johnston turns to Damasio’s notion of the emotional brain, which is indissociable from the cognitive brain—except when brain damage has occurred. For Damasio, emotions come before feelings, and feelings can either be conscious or unconscious (164), meaning that to have a feeling is not the same thing as to know a feeling; feelings, in Damosio’s sense, are defined as the “brain’s body maps” (166). This mapping proceeds as a constant retracing and partakes in the ongoing “self-modeling activity” of itself and of the self (167). The “brain” encompasses multidimensional circuits in which emotions correspond to processes entangled with non-emotional dimensions (177). The neurosciences have reconfigured the brain as “hardwired to rewire,” a view Johnston believes is akin to Lacan’s notion of lalangue. Johnston, however, rejects Lacan’s premise that affects may be misleading us not about what they are, but about why they are. He maintains that, given the structure of the brain outlined above, affects do mislead us at the level of what they are. Affects are thus not limited to felt feelings per se; rather, they encompass much more and because of this “affective life must be lived under the permanent shadow of doubts about passions and sentiments as self-evident, self-transparent, and self-sufficient experiences” (210). Johnston’s and Malabou’s conclusions offer inspiring trajectories for a multidimensional dialogue between philosophy, psychoanalysis and the neurosciences. The work presented in this volume provides useful insights into the development of a new libidinal economy and a new theory of affects that emerge only by entangling these disciplines. Their proposals raise tremendous challenges for psychoanalytic and philosophical considerations because it invites to a reconfiguration of the psyche itself. First, Johnston reinstates the prevalence of affect for psychoanalytic considerations by showing that affects are not always conscious: Freud has struggled immensely in regards to the affect of guilt and adheres to a model of a “structural relationship of the unconscious with affects via the feeling of guilt” (212), whereas Lacan recognizes the entanglement of the affect of anxiety, as primal (and only) affect, to the unconscious (213). Revisiting Lacan’s claim that “[t]here is no representational rapport between affect and signifier” (213), Malabou explains the ways in which the neurosciences also reject an explication of representational mechanism within the brain. These developments reveal that emotions designate the “relational dynamic between brain and body, the very movement of the psychosomatic totality” (217). An emotion does not designate a single “passion” but is a regulative mechanism, and minimal excitation level must be maintained for other affects to be produced, for life itself to be maintained: “the brain affects itself in regulating life” (217). The emotional brain is thus a paradox given that “inertia,” “stability” and “constance” require foremost autoexcitation. The brain’s first mechanism is to self-regulate before it can regulate itself in response to an external world (217). In regard to a cerebral modality of representation, the configuration of an emotional brain suggests an ongoing process whereby the brain attempts to (re)present itself to itself in forming maps of body-states; this attempt is formative in enabling the brain to (re)make itself constantly. The cerebral unconscious—a core self—thus emerges at the junction of the “brain’s treatment of internal excitations” and “the autorepresentation activity” tied to this treatment (219). The “cerebral unconscious” is not nonconscious but a cerebralization of affects comprising the ensemble of processes of autoregulation within the brain, whereby three undifferentiated processes happen as one phenomenon: homeostatic processes, the birth of the self and the birth of the object. From there on, how do we conceive of autoaffection? As shown, the brain’s autoaffection produces the unconscious, but this process requires an “impassibility and neutrality of the conscious subject” (221) that generates a structure for subjectivity that is always a potential for disaffection. Hence, there is no unity of the self (223). Johnston’s intervention has prompted more questions, especially the notion of misfelt feelings he put forth, which has tremendous implications as to how one can give an account of oneself. My dilemma in reading Johnston is his assumption that there is a truth to feelings, a truth that can evade the subject who feels as it feels yet can be revealed by an external other. When considering the process through which truth is determined, we must consider on whose authority a proposed truth is accepted as true. In line with the work of Judith Butler (1993), Michel Foucault (1976, 1993) and Karen Barad (2007), I believe necessary to consider how authority is determined via context and how the type of authority that determines the truth in question plays an integral role in creating that very truth. In short, I wonder how we might to situate Johnston’s understanding of truth in light of the politics and economy of truth. Along similar lines, the overlapping of concepts such as emotions, feelings, affects and passions within the different corpus lead me to question why Johnston is so adamant to reconcile conflicting accounts of affect in psychoanalysis and the neurosciences. What are feelings? How do subjects acquire knowledge about feelings? Furthermore, given the special status given to anxiety in his reading of psychoanalysis, it appears that all affects do not share the same substance and/or lead to equivalent psychosomatic effects. Anxiety has been described as diffuse, nebulous state of agitation, a phenomenon that, once submitted to evaluation, is subjected to specific cuts, a boundary-making process that produces historically, contextually and physiologically bound feelings, whereby “feelings” are psychosomatic effects, cultural specific and bodily incorporated in processes of corporeal generosity, and materializing in the flesh (cf. Prosser; Diprose; Wilson). Moreover, if all felt feelings emerge from a topography of anxiety, how is knowledge about feelings acquired—or even created? Consider a child. Children are at times unclear as to what they feel; they may be in a state of agitation, a state of a diffuse anxiety. Understanding the cause of such agitation is incumbent upon the parents. A child has not yet developed the proper tools that enable her to identify such “feelings.” Now one could say that this stage only requires a recognition pattern of feelings, whereby one represents to oneself what those feelings are but the feelings themselves are left untouched. I would maintain that this is far from being the case. A child, for instance, may be mistaking a feeling of hunger with anger; in the process of teaching a child to recognize bodily states and feelings, parents therefore actively partake in making knowledge that will materialize psychosomatically, whereby they enact an “agential cut” within a particular phenomenon—anxiety as diffuse—to make another phenomenon: a felt feeling (Barad 2007, Haraway 1990, 1997). I doubt there is an affect behind that is not diffuse, as disturbance, without the making of a phenomenon through this cut: affects are produced through the process of differentiation, a process that creates boundaries whereby, echoing Malabou, the process of identification itself is a modification, an affect, that generates subjectivity. Such a view does not reject Johnston’s rich analysis; instead, it problematizes his assumption that there is an objective truth to the occurrence of a subjective affect by speaking to the complex entanglement of the powers that establish the truth of such matters. Barad, Karen. Meeting the Universe Halfway. Durham: Duke University Press, 2007. Diprose, Rosalyn. Corporeal Generosity: On Giving With Nietzsche, Merleau-Ponty, and Levinas. New York: SUNY Press, 2002. Foucault, Michel. Histoire de la sexualité I : La volonté de savoir. Paris: Gallimard, 1976. ———. Surveiller Et Punir. Paris: Gallimard, 1993. Haraway, Donna. Modest_witness@second_millenium. Femaleman Meets Oncomouse: Feminism and Technoscience. New York: Routledge, 1997. ———. Primate Visions: Gender, Race, and Nature in the World of Modern Science. Reprint ed., Routledge, 1990. Prosser, Jay. Second Skins. 0 ed., Columbia University Press, 1998. Wilson, Elizabeth A. Psychomatic: Feminism and the Neurological Body. Durham: Duke University Press, 2004. Dr. Emilie Dionne is a postdoctoral researcher in Feminist Studies at UC Santa Cruz. Her work focuses on feminist materialism, new ecologies and onto-epistemologies. She has completed her Ph.D in Social and Political Thought at York University in 2013.